But in fact these days I feel very down. For those who have child/ren not sure if you feel the same way as me... when my kid is cheated by her friend, plus received some unfair comments from another mean kid, I rather is the one who gets hurt. I feel I am so helpless ... although she behave so calmly seems able to comfort to me a bit, or maybe, she doesn't feel as sad as me??? Then I opened her collection box and saw all these fluffy chicks, I laughed. Inspired by the soulful saying about turning lemon to lemonade, I decided to make these cheesecake "eggs". Use a very sharp serrate knife to cut off the chocolate shell's top (empty the toy), spoon in some cheese pudding, drop the cake/muffin in the center. Decorate with tiny fluffy chickens. Of course as parents we keep the sadness on behalf of our kids longer than the kids themselves. They forget very quickly. Extremely cute! That is a wonderful idea and treat. hi gattina, super cute! i do not know abt these choc eggs but certainly this will certainly put a big smile whoever sees it and i'm sure your kid love this too. Cheer up!! I perfectly understand what you are going thru. I have taught my gal to stand up for herself and am glad that she is begining to defend or brush off uninviting remarks. I am sure your kiddo's saddness disappeared when she saw these. Being a parent myself, I can relate with your feelings. Your daughter is blessed to have someone so deeply understanding of her feelings. hi rosa and katie, big thanks to you! And Katie, for some reason I haven't been able to post a comment in yr blog (for months already), I'll write to you then if the problem continues. 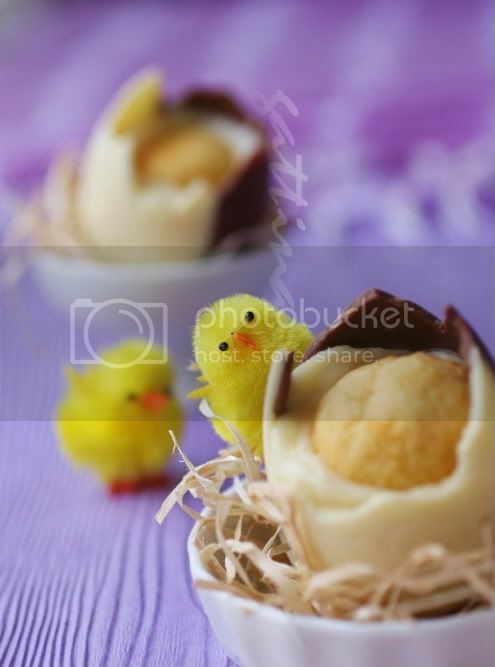 How cute are these...and I made them for my Easter dessert! I found the eggs locally, inside was a marshmallow duck which I removed. 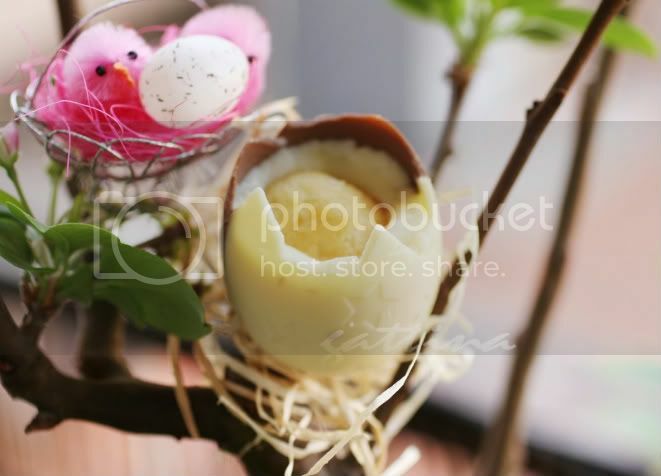 I filled the eggs with tiramisu creme/bit of ladyfinger on top and bottom, garnished with egg top with duck. CUTE and yummy. Thanks for the inspiration. And to my lastest visitor, thanks for your great idea!!! I'm sure doing it again and using tiramisu! The chocolate eggs in your area filled with marshmallow duck? Sound super lovely!